Guys, Check out this newly released amazing children's book that your kids will surely love! 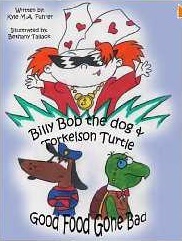 It is a book from Indie author Kyle Fuhrer, entitled "Billy Bob the Dog & Torkelson Turtle: Good Food Gone Bad"
It is intended for children ages 2-5 and was crafted to be similar to Richard Scary's Busy World children books from the 1980's. The book description is short and sweet: Welcome to Fiddlers Green -- a kooky little town filled with crazy characters who are always having fun and learning new things on their many adventures. About the author, he is a great friend of mine. Kyle Fuhrer has a degree in Political Science and History. Kyle has been a historical interpreter, successful webmaster, home handyman, vintage gaming expert and even a bouncer in a nightclub. He has a wonderful sense of humour, a zest for life and passion for purposeful living. He is - without a doubt - one of the most charming and charismatic young men you'll ever meet. And like many university graduates, Kyle has written countless papers on a variety of themes. Good Food Gone Bad is Kyle's first excursion into children's literature. Kyle hopes to write and publish 10 books in the Billy Bob the Dog and Torkelson Turtle series. The book sells for 2.99 usd and is available on all amazon outlets.